With easy cleaning and conscientious use, the classic butcher block can last a lifetime—or longer. Here's how to clean and maintain the material. Butcher block counters are a perennial favorite in the kitchen, though many homeowners worry about the care and maintenance the surface potentially demands. It’s true that butcher block probably does require a bit more attention than other countertop materials, but it’s not particularly difficult work, and there’s no beating the payoff. Properly cared for, butcher block can last a lifetime. No other countertop boasts such longevity (or forgives so much). If you have butcher block counters or are contemplating the prospect of installing them, read on for details on how to keep these handy surfaces in tip-top shape. Just as pots and pans, dishes and kitchen tools must be cleaned after use, so too must be butcher block. Daily cleaning does not take long and requires no special tools or materials, but time is of the essence: Clean butcher block before the wood grain has the chance to absorb stains and become discolored. Food residue may be scraped away with a smooth, flat, and ideally plastic spatula, and the surface should be sponged off with only mild-dishwashing soap. Undiluted vinegar, by the by, works great for cleaning and disinfecting butcher block, and this type of vinegar does not leave behind a strong, pungent odor. Soon or later, even those who conscientiously care for their butcher block are going to encounter a stain. Before you reach for the sandpaper, try one of these two easy stain removal methods (note that both are safe for food prep surfaces). First is a kitchen superstar, lemon. Even in tough circumstances, it can work wonders in the case of butcher block. Sprinkle a bit of coarse salt onto the stained area, then rub it in with half of a lemon. If the stain does not vanish more or less immediately, return to it a day later and see if either soap or vinegar helps the situation. You might also try baking soda, particularly if you’re dealing with a fresh spill. Blanket the stain in the powder, rub it in and let it sit, then scrub with either soap or vinegar moistening your sponge. The beauty of butcher block is that, if it should ever become irredeemably stained, you can always refinish it. (You might also choose to do so, if the surface sees uneven wear.) First, use a coarse-grit sandpaper to rub out the stain, then switch to a finer git so that you can smooth things out. 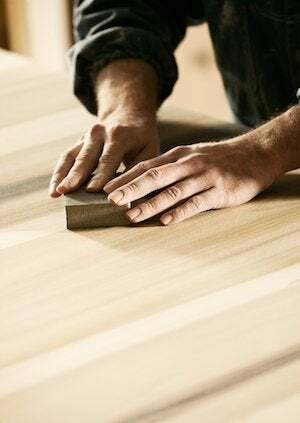 After sanding, apply food-safe mineral oil or raw linseed oil. Evenly rub the oil into the wood and wipe off any excess. If the wood quickly absorbs all the oil, add another coat. Remember that proper care of butcher block entails oiling the entire surface every six months or so, at minimum. Howard Butcher Block Conditioner (view on Amazon) stands out as a popular favorite for ongoing, routine surface protection. In some homes, butcher block counters serve as the main food prep surface. If your kitchen boasts only butcher block counters, be conscious of the fact that inadvertently you may be causing uneven wear. 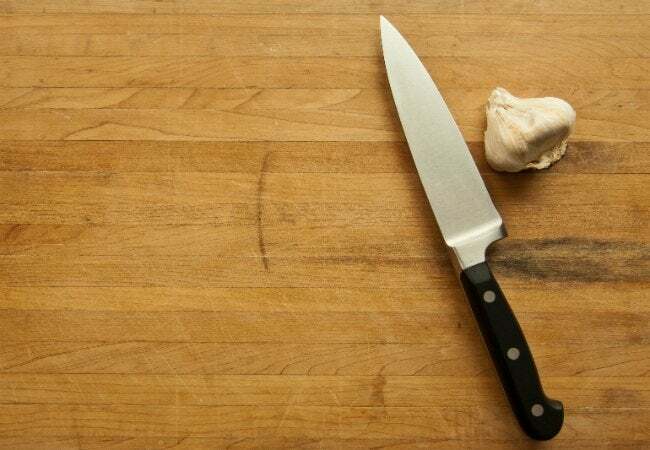 To avoid ending up with a single area that looks worn-out compared to the rest, try to do your chopping on a different part of the countertop each time you prepare a meal. Also, since wood absorbs moisture quickly, it’s a mistake to leave damp cloths or spills for any prolonged period of time on the wood surface. When not in use, you want the butcher block to remain relatively dry. As you cook, rub down the counters occasionally with a dry cloth in order to minimize moisture. That way, you can help preserve the butcher block for years to come!